Nuri became an agribusiness man. He improved the livelihood of his family and is able to provide them with a better future. Nuri Awel, a farmer and father of eight children, lives in Yetabon near Butajira in Ethiopia. 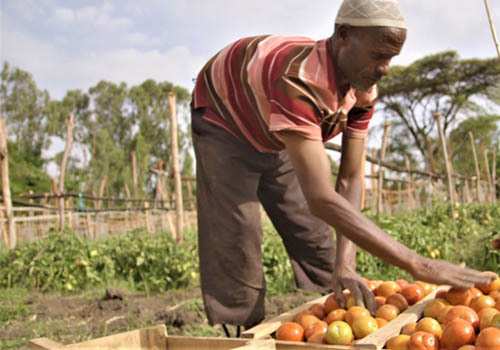 Since he joined the Fair Planet initiative, his tomato yields have shown a dramatic increase due to better seeds and improved farmer practices. Fair Planet partners with seed companies to help smallholders gain access to high quality seeds. The first training season resulted in a yield of 5 tons of tomatoes with a profit of 17,000 ETB ($730). After the second training season, Nuri grew more tomatoes with a profit of 54,000 ETB ($2300). Now he grows 2,000 m2 tomatoes, 400 grafted avocado trees and has built a fishpond and hen house. Fair Planet is a nonprofit organization that is facilitating access for smallholder farmers to seed of the highest-quality vegetable varieties suitable for their needs. At the same time, it is training the farmers to use these seeds with minimal changes to their traditional production practices. Trained farmers gain the opportunity to grow and sell significant crop yields and benefit from economic growth. Fair Planet now has five leading seed companies on board: Syngenta, Enza Zaden, Limagrain, East-West Seed and Bayer.